It has wonderful benefits for skin, and hair…and even nails, as you can discover in my tip for growing nails. The main benefit of this oil is the anti aging effect. 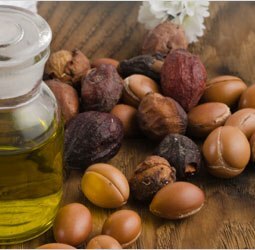 The smell is sweet, however you need to be very careful where you buy your argan oil, depending on the mills it is coming from, you will have huge difference in smells. Usually, argan’s “almonds ” are picked up by kids and women on the floor, without selection, so they pick up moldy almonds together with fresh fruits or even with pre eated and digested fruits. 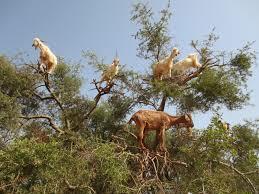 Indeed goats are fond of argan’s fruits, so they eat fruit…and reject kernels….you see what I mean??? This oil is used for centuries by women around mediteranean sea. ♦Mono insaturated fatty acids: around 45% of oleic acid. Benefits in cosmetic of unsaturated fatty acids: nourrishing, protecting, softening, regenerating, bring softness and bright back, preserve from early aging. ♦ Triterpenic alcohol (beta-amyrine, butyrospermol, tirucallol): protecting the skin, anti fungal properties, anti viral and anti inflammatory properties. (you will read again about “terpenic” in France’s Organic Beauty Secrets blog, this is one of the component found frequently in essential oils…you know…the one which have an anti inflammatory benefit). ♦Sterols (spinasterol and schottenol) are improving the natural protecting skin barrier as well as micro circulation, it also slow down the skin aging, is an anti inflammatory and is protecting against UV action. ♦ Triacyglycerids: softening benefits, helps regenerating the lipid film on your skin. Now we can fully understand why argan oil has these numerous cosmetic properties: Hydrating, protecting, smoothing, softening, regenarating, this oil is giving softness and is preserving your skin against aging.